The <anonymousAuthentication> element controls how Internet Information Services (IIS) 7 processes requests from anonymous users. You can modify the <anonymousAuthentication> element to disable Anonymous authentication, or you can configure Internet Information Services (IIS) to use a custom user account to process anonymous requests. Anonymous authentication gives users access to the public areas of your Web or FTP site without prompting them for a user name or password. By default, the IUSR account, which was introduced in IIS 7.0 and replaces the IIS 6.0 IUSR_computername account, is used to allow anonymous access. An application is a grouping of files that delivers content or provides services over protocols, such as HTTP. When you create an application in IIS, the application's path becomes part of the site's URL. By default, IIS 7 uses Anonymous authentication. You must disable Anonymous authentication for any Web site, Web application, or Web service for which you want to enable other authentication methods such as Basic or Windows authentication. IIS 10.0 The <anonymousAuthentication> element was not modified in IIS 10.0. IIS 8.5 The <anonymousAuthentication> element was not modified in IIS 8.5. IIS 8.0 The <anonymousAuthentication> element was not modified in IIS 8.0. IIS 7.5 The <anonymousAuthentication> element was not modified in IIS 7.5. 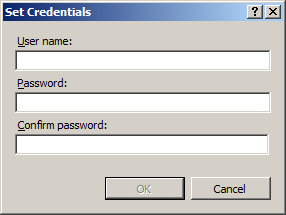 IIS 7.0 The <anonymousAuthentication> element was introduced in IIS 7.0. IIS 6.0 The <anonymousAuthentication> element replaces the IIS 6.0 AuthFlags, AnonymousUserName, and AnonymousUserPassword metabase properties. 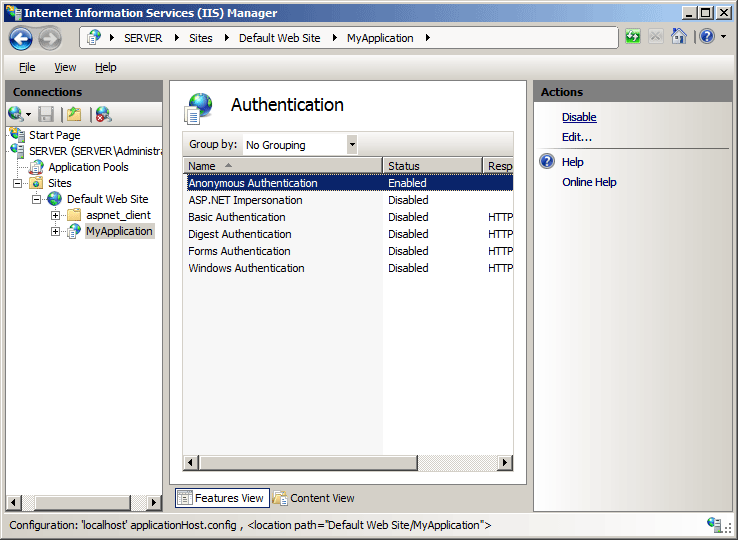 The <anonymousAuthentication> element is included in the default installation of IIS 7. 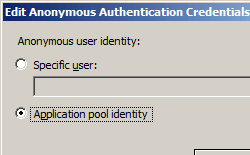 The <anonymousAuthentication> element is configurable at the site and application level in the Web.config file. 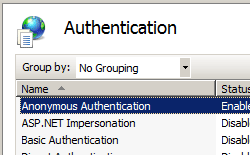 Specifies whether Anonymous authentication is enabled. The logonMethod attribute can be one of the following possible values. The default is ClearText. This logon type is intended for batch servers, where processes may be executing on behalf of a user without that user's direct intervention. This logon type preserves the name and password in the authentication package, which allows the server to make connections to other network servers while impersonating the client. This logon type is intended for users who will be using the computer interactively. 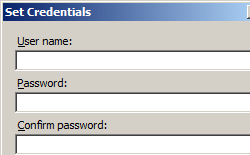 This logon type is intended for high performance servers to authenticate plaintext passwords. Credentials are not cached for this logon type. Specifies the password for Anonymous authentication. Note: To avoid storing unencrypted password strings in configuration files, always use AppCmd.exe or IIS Manager to enter passwords. If you use these management tools, the password strings will be encrypted automatically before they are written to the XML configuration files. This provides better password security than storing unencrypted passwords. Specifies the username for Anonymous authentication. If you leave this value blank (that is, username=""), Anonymous authentication uses the application pool identity to authenticate anonymous users. The default value is IUSR. The following examples enable anonymous authentication and change the default username and password used for anonymous authentication to an account named IUSR and a password of P@ssw0rd.